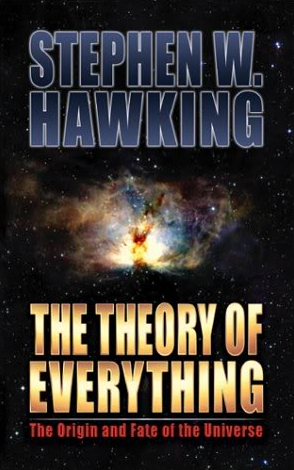 The theory of everything by Stephen Hawking is a series of seven lectures. This book presents the most complex theories about black holes, expanding the universe, the origin of everything, the direction of time, and the big bang. He briefly describes the ideas of the universe from Aristotle, Newton, Einstien, Augustine, Hubble, Friedman, Galileo, and many more scientists and philosophers. In 1928, an Indian, Subrahmanyan Chandrasekhar calculated that a cold star of more than about one and a half times the mass of the sun would not be able to support itself against its own gravity. This mass is now known as the Chandrasekhar limit. Why don't we notice all extra dimensions if they are really there? Why do we see only three spaces and only one facet? The suggestions are that the other dimensions are curved up into a space of very small size, something like a million million million million millionth of an inch. This is so small that we just don't notice it. The construction of a complete unified theory of everything is very difficult. So we have made progress by finding partial theories. The universe would have started in a smooth and ordered state. But with the time went on it become lumpy and disordered. It appears that the universe evolves according to well-defined laws. We don't know if that may be ordained by God, but it seems that we can discover and understand these laws. According to the author, the laws of physics do not distinguish between the past and the future. In other words, life would be just the same for the inhabitants of another planet who were our mirror images and who were made of antimatter. This book is a boon for physics lover. The author didn't include complicated mathematical equations. He kept language simple and easily understandable. The author mixes science with philosophy. It exhibits a subtle sense of humor in the book. It's a short read. Stephen Hawking poses interesting questions about God. All in all, a recommended reading. Stephen Hawking is widely believed to be one of the world's greatest minds: a brilliant theoretical physicist whose work helped to reconfigure models of the universe and to redefine what's in it. Imagine sitting in a room listening to Hawking discuss these achievements and place them in historical context. It would be like hearing Christopher Columbus on the New World. Hawking presents a series of seven lectures - covering everything from the big bang to black holes to string theory - that capture not only the brilliance of Hawking's mind but his characteristic wit as well. Of his research on black holes, which absorbed him for more than a decade, he says, "It might seem a bit like looking for a black cat in a coal cellar." Hawking begins with a history of ideas about the universe, from Aristotle's determination that the Earth is round to Hubble's discovery, over 2000 years later, that the universe is expanding. Using that as a launching pad, he explores the reaches of modern physics, including theories on the origin of the universe, the nature of black holes, and space-time. Finally, he poses the questions left unanswered by modern physics, especially how to combine all the partial theories into a "unified theory of everything." If we find the answer to that, he claims, it would be the ultimate triumph of human reason. A great popularizer of science as well as a brilliant scientist, Hawking believes that advances in theoretical science should be "understandable in broad principle by everyone, not just a few scientists." In this book, he offers a fascinating voyage of discovery about the cosmos and our place in it. It is a book for anyone who has ever gazed at the night sky and wondered what was up there and how it came to be. Stephen William Hawking was born on 8 January 1942 in Oxford, England. His parents' house was in north London, but during the second world war, Oxford has considered a safer place to have babies. When he was eight, his family moved to St Albans, a town about 20 miles north of London. At eleven Stephen went to St Albans School, and then on to University College, Oxford, his father's old college. Stephen wanted to do Mathematics, although his father would have preferred medicine. Mathematics was not available at University College, so he did Physics instead. After three years and not very much work he was awarded a first class honors degree in Natural Science. Stephen Hawking worked on the basic laws which govern the universe. With Roger Penrose, he showed that Einstein's General Theory of Relativity implied space and time would have a beginning in the Big Bang and an end in black holes. These results indicated it was necessary to unify General Relativity with Quantum Theory, the other great Scientific development of the first half of the 20th Century. One consequence of such a unification that he discovered was that black holes should not be completely black, but should emit radiation and eventually evaporate and disappear. Another conjecture is that the universe has no edge or boundary in imaginary time. This would imply that the way the universe began was completely determined by the laws of science. Professor Hawking received twelve honorary degrees, was awarded the CBE in 1982 and was made a Companion of Honour in 1989. He was the recipient of many awards, medals, and prizes and is a Fellow of The Royal Society and a Member of the US National Academy of Sciences. He died in 2018.